What's more tempting than the aroma of fresh baking? what's more satisfying than seeing homemade jam tarts or a cake in the tin? Always supervise young kids in the kitchen. Always teach your kids to wash hands before cooking and eating. Collect items you need before calling young kids to get involved. Don't let kids taste food with raw eggs in because of salmonella risks. Teach your kids about heat and knives and cheese graters. Mop up spills to prevent accidents. 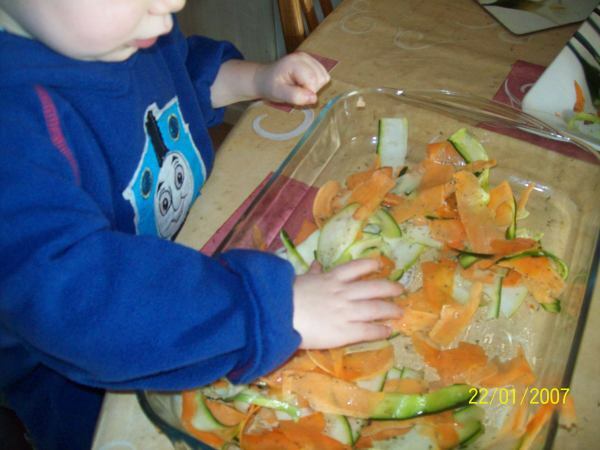 If you are busy in the kitchen why not let your kids play with empty pots, pans and wooden spoons. They could even make pretend dinner with playdoh at the table. If your child has disabilities take even more care. Our youngest daughter is unable to sense heat until she touches the source. she needs extra supervison and at eight still needs to be kept away from hot ovens hobs. Mix together to make a soft dough. Allow to stand for about half an hour. Bake in moderate oven from 45 to 60 minutes. Pour the milk and soda into butter mixture and stir. Pour a little flour onto a work surface, place dough onto this then roll out using a floured rolling pin. Cut into any shapes you like. Sprinkle tops with granulated sugar then bake in a moderately heated oven. Get kids to break chocolate into pieces and put into saucepan. The kids can add margerine and syrup. Stir contents of pan until chocolate has melted. Add cornflakes then kids can stir until cornflakes are well covered. Put into cake tins and gently press down the mix. Allow to cool for around 2 hours then cut into pieces. Ask kids to sieve the flour into mixing bowl. The kids can put the margarine and lard on top of flour. Show kids how to rub it into flour with their fingers until there are no lumps of margarine or lard left. Get kids to add a tablespoon of water and stir it in. Press the mixture together tightly with your hands. If it won't come together and falls apart add a tiny bit more water. Get kids to put pastry ball onto a floured surface. Show kids how to roll out the pastry until it is thin. kids can then cut out 12 circles of pastry using a 7.5cm pastry cutter. Ask kids to grease the jam tart tray . Take the circles of pastry and place into the dents on tray. Bake in the oven for about 15 minutes at 200ºC/400ºF. Place jam tarts on a wire cooling rack. Be careful hot jam can burn. 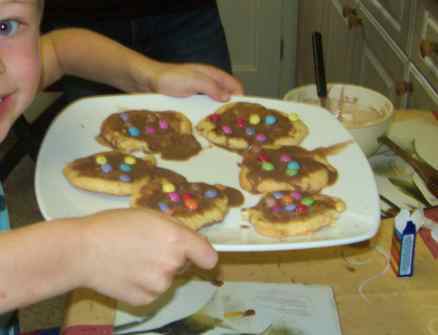 They can then add the sugar and syrup to pan. Put pan on low heat until this is all combined well. (Either you or the kids dependent on ability). Get kids to add the oats and raisins and mix. Spoon in a tin (6-8 inch). Bake in a medium oven for 15-20 minutes. Put ingredients in mixing bowl and mix together well. Kids can then spoon the mixture into the greased cake tin. Kids can sieve the flour into a bowl. Get kids to add the sugar. Beat the margerine and sugar with wooden spoon until the mixture is pale and fluffy-looking. Beat the eggs in a small bowl with fork. If it starts to look as if it's curdling add a spoonful of the sieved flour with the egg. Once the kids have added all the egg the rest of the flour can be added. Get kids to add it in 2 halves and fold it in using metal spoon. Help kids to divide the mixture between 12 paper cases. Cook in the centre of the oven for 12 to 15 minutes until well-risen and golden-brown. Put butter, icing sugar and cocoa powder in a mixing bowl and beat them together. Get kids to spoon icing onto the cakes. You will need: 13x9" deep baking tray, large bowl, wooden spoon. sieve. Kids can grease a 13x9" deep baking tray. Get kids to put butter, sugar, vanilla, and eggs, in a large bowl. Ask kids to use wooden spoon and beat these together. Use a sieve over the bowl and sieve cocoa, flour, baking powder and salt. Get kids to put margerine in a saucepan. They can hold open end of bag gently closed, then bash bag with a rolling pin. Do this until biscuits are crushed. Pour biscuits into pan with margerine mixture and stir together well. Cut into bars and eat. You will need:1 bagel, tomato sauce, mozarella cheese, peppers, onion, tomatoes and herbs from your garden. Set oven to low, 150oC. Chop toppings into small pieces and add to bagel. Grate mozarella cheese and sprinkle over top of bagel. Sprinkle over a few chopped leaves of herbs. Put in oven for around 5 mins until cheese is bubbling. Get kids to grease baking tray well. Ask kids tio sieve flour and salt into the mixing bowl. They can then add the sugar and yeast. The kids can then pour in warm water. Now with their hands the kids can mix the ingredients together. Take the dough out of bowl and put onto floured surface. kids can now knead the dough for around 10 mins. The kids can shape these now into their own design. Put designs onto baking tray, cover with clingfilm. Put tray into warm place for around half an hour. The designs should double in size. To check if cooked turn roll over and tap the bottom, it should sound hollow. Tip: We like to add 50g of cheese to our ingredients or you could try dried fruit. Thinly slice vegetables. Place into baking tray and drizzle with olive oil. Bake in oven on medium heat until crispy. The kids baking recipes are loved and the eating even more so (by them anyway). It's good to experience those ooh's and ahh's of delight (is it delight? ),as the relatives sample the first fruits of the kids baking recipes experiences. They try so hard to enjoy those slightly salty biscuits, and nearly jamless(cos its all spilled out on the tray) jam tarts. We've loved eating cheese sauces tasting of flour, fruit cheesecakes that haven't set, and cakes that haven't risen. What we have really enjoyed is the kids baking recipe successes as they have experimented. On saturday mornings the kids make bread with their dad, it's great family bonding time. Not only do the kids love doing it, the house smells lovely and we can all enjoy eating it. As our kids have got older the older kids teach the younger kids. They duplicate their skills into the younger kids as they do baking together. We hope you enjoy baking with kids.